The cold winds of change are blowing – or is that just the sudden onset of winter? There is certainly change in the air at Scene by Hird. Today, I quit my day job! After threatening to do so for the last 2 years, I’ve finally gathered the courage to leave a nice, secure career in geology in favour of devoting more time to my art. Fifteen years ago, I left university with a degree in geology. Since then, my day job has been in the mining industry, with photography being both a passion and a part time source of income for me. On the ninth of June, I left it all behind. It’s still way too early to judge whether the move is shear folly or an act of bravery. In any case, sometimes that distinction is blurred beyond recognition! What I can discuss with some certainty are the reasons behind my decision. Around 10 years ago, it dawned upon me that there is only one asset I truly own: my time. Every other “asset” in my life could be re-acquired after losing it, selling it or giving it away. However, my time is the one thing I can never get back – once I’ve spent it, it has absolutely gone for ever. Once that simple fact had sunk in, many other aspects of my life crystallised. Time for myself (which includes my time with my family) became most precious – literally priceless. Work time – the time I trade for someone’s money – was a different matter. That time can be valued, and I place a very high value on mine. Unfortunately, employers do not always agree with my valuation - in fact, they never have - so I have always compromised between working in a profession I enjoy and being adequately compensated for spending my time. Now, the time for compromise has passed. I’m forty years old. I estimate I have between twenty and thirty years of productive time remaining in which I still have the ability to make the photographs I’m proud of. It seems like a long time, but it’s not. For instance, twenty years ago Bon Jovi were topping the music charts and the Chernobyl Disaster had just occurred. Admittedly both were devastating events in the history of the world, but they seem like only yesterday in my memory. However, what worried most (even more than a Bon Jovi revival) was the thought of sitting in my comfy chair twenty years from now, realising the chance to reach for my dreams had passed just as quickly. I quit my day job so that I could spend more of my time doing something I love. If I were to delay the decision any longer, I would have festered in my later years regretting the things I had never done – and surely, that’s no way to spend time …..
Part of my reason for devoting more time to the gallery is to be able to expand our business. To do that, we plan to open another gallery in Perth. I can’t divulge too much just yet, but I can announce that we intend hold our opening night in October. Have you ever wondered what happens to the ground when lightning strikes? To say “it fries” would be an understatement! The temperature inside a bolt of lightning has been estimated to be over 100,000 degrees Celsius, so you would imagine the consequences of a strike would be severe for any object – including the ground. A strike in the sandy soils of the goldfields almost instantaneously melts the quartz to form a natural glass. Any contained moisture vaporises at the same time, forming a small blob of bubbling, super-hot glass. If the conditions are perfect, the glassy mass remains after the storm passes. If there is no sand, the glass doesn’t form at all. If there is too much water in the soil, the mass explodes due to the rapid expansion of gases. The blobs of sand are called fulgurites (after the Latin term for lightning). They often have a dendritic appearance (shaped like a tree) due to the shape of the bolt as it passes through the ground. 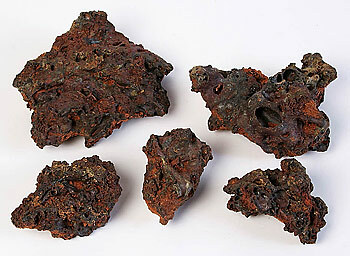 Fulgurites have been likened to “fossil lightning”. Over many years, the sandy soils erode away from the fulgurites, leaving them exposed at the surface. During my time in the bush, I often come across them, and since I’m a soon-to-be former geologist, I am aware of their appearance and occurrence. On a recent mountain bike ride, I found a small group of them and collected the five best examples. I believe at one time they were all joined as one, but they have broken apart during the erosion of the soil. As a special offer, I’m giving them away to the next five people who buy a lightning photo from me. To claim one, simply tell me you would indeed like fries with that print! If you have ideas for a workshop, let me know and I’ll come up with a course structure if it’s within my sphere of knowledge. During the year, the direction of sunrise and sunset changes. It is only near the spring and autumn equinoxes that the sun rises at due east and sets at due west. During winter, it rises and sets further north. During summer, it does so to the south. Now is the time to get those shots where you need the sun coming from the ENE in the morning or WNW in the afternoon. The low side-lighting which is idea for landscape photography is currently as far north as it gets. In the Goldfields area, the sun rises about 30 north of due east (ie on a bearing of 060) throughout June. It also sets about 30 north of due west (ie. on a bearing of 300). Armed with this knowledge of the lighting direction at each end of the day, it is possible plan for landscape photographs which can’t be produced at any other time of the year. 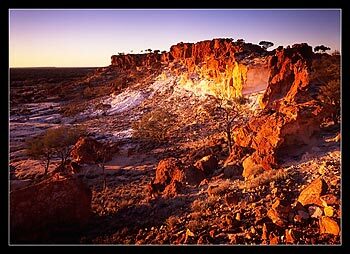 Last year, I used winter light to make my shot of the breakaways 70km north of Leonora (which I call "Painted Cliffs”). 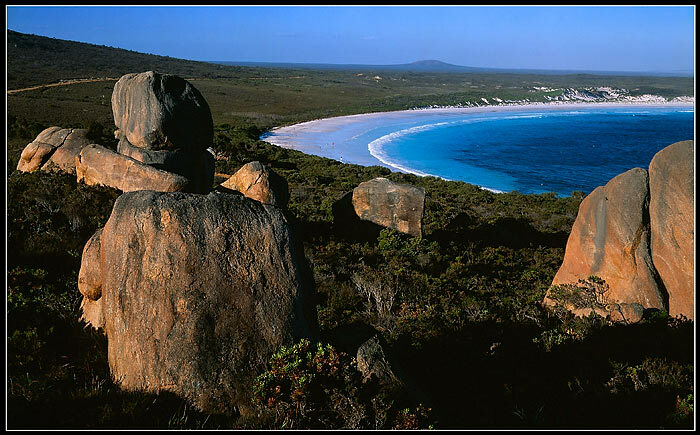 This month I have published a shot of one of the most beautiful beaches in Australia – Lucky Bay, Cape La Grande NP. It represents a departure from my usual style of working, since I shot this while the sun was still quite high in the sky. Normally, I’ll wait until close to sunset for low, warm light to engulf the scene I’m shooting. However, in this case, I wanted bright sunshine to illuminate the beach, highlighting the brilliant white sands and pure blue waters of the Southern Ocean. In the Goldfields, we are blessed to be able to call this beach our local one …. Thanks for reading once again. I appreciate the replies I receive each month and your own related stories make each day that much more fun. Note: If you no longer wish to receive this newsletter, please click here and send me an email telling me so. I hate spam as much as anyone, so please let me know if this newsletter is unwanted.